Stumptown Dumplings is a food cart located at the newly formed Alberta-15 food pod (an alleyway near NE Alberta and 15th) in Portland, Oregon. Nimesh Dayal and Justin Prasad are the co-owners here. They had been open for a couple of weeks prior to the pod's official May 31 grand opening, and they have already received rave reviews from several customers. The Alberta-15 pod started with four food carts, most of which serve Asian-inspired food. 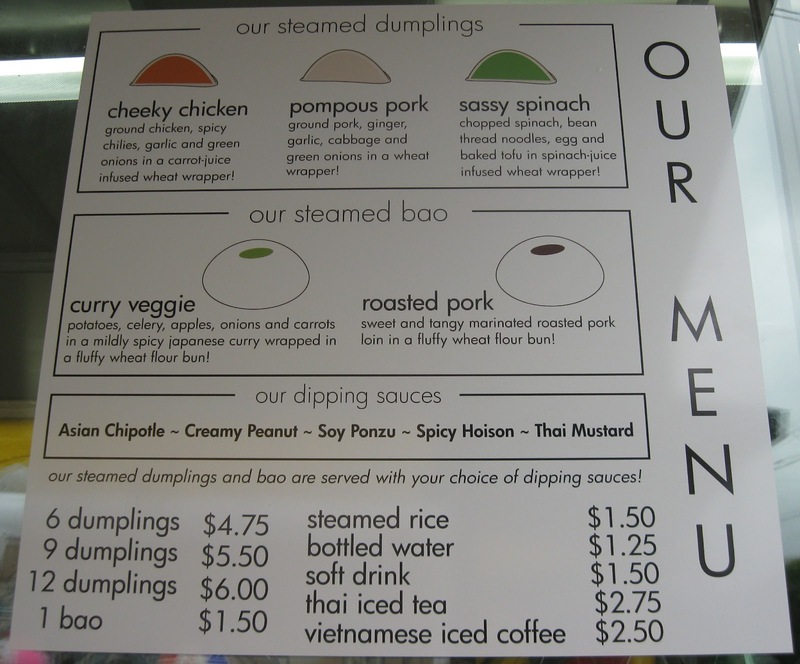 At Stumptown Dumplings ("Stumplings"), it's dumplings and Chinese bao, a steamed bun with various fillings (traditionally pork). 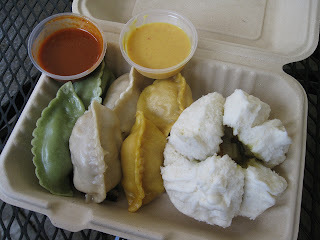 The dough for the steamed dumplings are conveniently color-coded, allowing the person to know which one is which before biting into it. There are three types: (1) chicken with chiles, garlic, green onion in an orange wrapper (thanks to carrot juice); (2) pork with ginger, garlic, cabbage, and green onion in a regular wheat wrapper; and (3) spinach with bean-thread noodles, egg, and baked tofu in a spinach juice-infused wheat wrapper. Along with a roast pork bao, Nimesh and Justin have a curry veggie bao containing potatoes, celery, apples, onions, and carrots in a mild Japanese curry. Both buns use wheat flour. They are generally sold in sets of six, nine, or twelve, and you may customize your order. I got two of each dumpling, plus a curry veggie bao, just for something different. There are five sauces: Asian chipotle, creamy peanut, soy ponzu, spicy hoisin, and Thai mustard. I decided to try the Asian chipotle (a red sauce), and the Thai mustard (yellow in color). Perfectly steamed products here. Of all the dumplings, the pork was my favorite. Just simple, explosive flavors with the garlic and ginger. 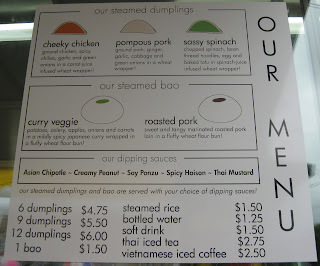 I also loved the chicken dumpling here. Despite advertising chiles, I couldn't detect any spice. It's to be expected after destroying my spicy sensors many years ago. The spinach one was also prepared well, but just didn't have the flavor burst the other two had. I enjoyed the curry veggie bao. Dough steamed nicely, with a delicious, balanced curry filling. I honestly would have liked more filling and less dough here. A cool presentation, having an open top to the bao so one can see what's inside. Of the two sauces I tried, Asian chipotle was the clear winner. A mix of sweet and tang, and a controlled kick from the chipotle. I liked the Thai mustard, but it basically lost via TKO to the chipotle. Those dang peppers simply knock out other contenders, plain and simple. After a nice stir...lovely color! 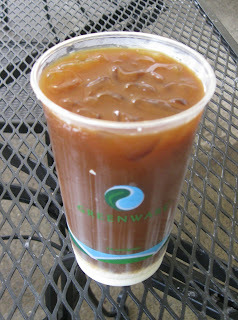 Last, but not least, I ordered a Vietnamese iced coffee ($2.50). On a rather humid day (for Portland standards), it was one heck of a refreshing drink.